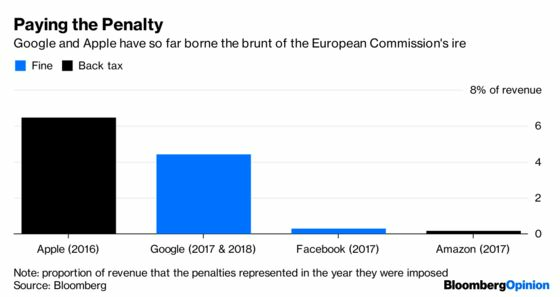 (Bloomberg Opinion) -- As another European Commission mega-fine on Alphabet Inc. nears, it prompts the question: can the Google parent ever free itself from the specter of penalties from the region’s regulators? The same goes for Amazon.com Inc. and Facebook Inc., each of which is facing scrutiny for how they handle data. They could do a lot worse than looking to a fellow West Coast tech giant for a playbook. It wasn’t all that long ago that Microsoft Corp. was the European Commission’s nemesis. For most of the first decade of the millennium, the firm was under fire over the way it bundled products with its then-dominant Windows operating system. It became the subject of what were then record fines. Fast forward to 2019, and Microsoft is firmly in regulators’ good books. That’s the result of a concerted effort to turn things around. Silicon Valley, take note. For a long time, Microsoft’s approach to the Commission was antagonistic. Its attitude seemed to be that “these European bureaucrats just don’t understand technology, they’re wrong.” That pig-headedness was well exemplified by the 860 million-euro ($982 million) fine officials imposed in 2008 for failing to comply with an earlier ruling. About five years ago, the company’s attitude started to shift. It realized that, more than just obeying the letter of the law, it had to be seen as a positive actor. It turned up the soft diplomacy: having top executives such as President Brad Smith meet more regularly with policy makers, and hosting drinks parties in Brussels. It helped that, in 2014, Satya Nadella succeeded Steve Ballmer as CEO, bringing with him an approach characterized more by humility than hubris. It went further. The technology industry was rattled in 2013 by Edward Snowden’s revelations of the extent of U.S. surveillance. Perhaps opportunistically, Microsoft pushed to redefine itself as a privacy advocate and lock arms with the Commission in objecting to U.S. demands for access to data. Google needs to find similarly common ground, and it could start by toning down moves that seem like threats, such as when it said last week it might shutter Google News in Europe in response to a planned copyright law which might force it to pay publishers more. Playing nice would help burnish the firm’s standing in Brussels as the investigation into alleged anticompetitive behavior in digital advertising winds down. Amazon is meanwhile in focus for the way it might use data to imitate products that third-party vendors sell on its site in order to squeeze them out. The volume of criticism of Facebook is soaring amid concerns over the spread of false information on its platform, and its granular data on user habits. Microsoft also offered remedies which made it seem more cooperative. For Internet Explorer, it decided to let Windows users choose which browser they wanted to use, after the regulator criticized how it linked the two products. That sort of industrial solution plays well in Brussels. But in this case, it also fed a fundamental change in the company’s business. The browser option helped Google’s Chrome steal market share from Explorer. That would make it all the more urgent for Microsoft to find revenue elsewhere. Personal computing now accounts for less than half of sales, and the shift toward other businesses can be explained in part by regulatory pressure. For Google and Facebook, this makes it even more important that they find revenue streams that don’t rely on targeted ads. That business accounts for almost all of the two companies’ sales, and depend on mining user data in a way that is drawing official scrutiny. Facebook sometimes appears guilty of the mindset that was once symptomatic of Microsoft, namely thinking that regulators are dumb and don’t understand its business. When Chief Executive Officer Mark Zuckerberg was quizzed by members of the European Parliament about privacy issues last May, he proved evasive and tried to unilaterally end the meeting when the line of questioning became difficult. Lawmakers were outraged. Perhaps Zuckerberg recognizes he needs outside help: After reportedly trying to lure Smith from Microsoft, he ultimately hired former British deputy prime minister Nick Clegg to head global lobbying efforts. 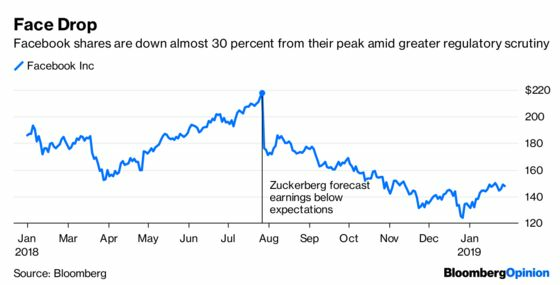 He faces a colossal challenge to change the company’s image given the pervasive European ill will towards the company’s founder and his lieutenant, Sheryl Sandberg. If Microsoft can do it, and become the world’s most valuable company once again in the process, so could they.